"Taipei 101" — "Taipei 101" is a landmark skyscraper located in Xinyi District, Taipei, Taiwan. The building, designed by C.Y. Lee & Partners and constructed primarily by KTRT Joint Venture and S. Korea's Samsung Engineering & Construction, was once the world's tallest skyscraper. 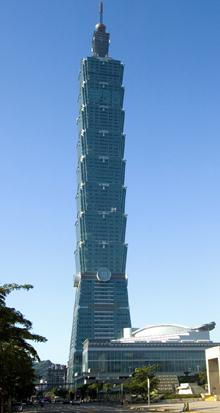 Taipei 101 received the Emporis Skyscraper Award in 2004. It has been hailed as one of the Seven New Wonders of the World (Newsweek, 2006) and Seven Wonders of Engineering (Discovery Channel, 2005). I last visited Taipei in 1983, and what was then a rather drab and sprawling non-descript metropolis, has now morphed itself with panache and verve into a sophisticated and vibrant capital city. Cradled in a large basin that in prehistoric times was an enormous lake, the city’s arteries are an amalgam of wide, tree lined boulevards, mimicking Europe’s best, and quaint old-fashioned, back-alleyways resonating with all the delights of Asia. Blessed with a sophisticated service industry, cheap and efficient public transport, a blend of modern shopping malls and traditional night markets, the best Chinese food in the world, and a vibrant nightlife scene – Taipei is surely one of the most unsung and underrated tourist destinations in Asia with something to offer everyone. Borrowing heavily from Chinese culture, both the exterior and interior of what was once ‘the world’s tallest building’ (Dubai has recently reached higher) Taipei 101 (7 Xinyi Road, Section 5; www.taipei-101.com.tw), is fashioned in the shape of a bamboo shoot – the Chinese symbol of resilience and strength. Rising to some 505 metres, this grey, slim behemoth, which dominates the city’s skyline, offers unparalleled views of Taipei and its environs. Unless in need of shopping therapy, give the first four floors (containing upmarket, expensive, outlets such as Prada, Armani, Louis Vuitton etc) a miss and take the high speed elevator to the top. Despite soaring an astounding 17 metres/second (still the world’s fastest lift), the whole ascent is remarkably smooth. At the top, beware of vertigo on the 91st floor’s outdoor observation deck as the clouds float past. To the north are impressive views of the Grand Hotel, the Dr Sun Yat-sen Memorial Hall and the majestic mountains of the Yangmingshan National Park. Because it’s not always calm some 500 metres up, Taipei 101 has a giant wind damper (or pendulum) weighing 660 tonnes, which is suspended between the 87th and 92nd floors to provide extra balance - and to combat any passing typhoons. Adult admission is NT$400 (AUD$18) and guided tours in English are available. An audio visual theatre on the 91st floor presents a potted history of the design and construction of the tower. As 101 is eminently visible from most parts of the city, it serves as a salient direction marker. at National Palace Museum in Taipei —National Palace Museum (國立故宮博物院), an art museum in Taipei City, Taiwan, is the national museum of the Republic of China, and has a permanent collection of over 650,000 pieces of ancient Chinese artifacts and artworks, making it one of the largest in the world. 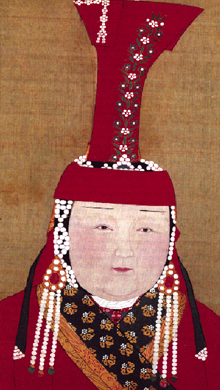 Most of the collection are high quality pieces collected by China's ancient emperors. First open to the public in 1965, the National Palace Museum (221 Chih-shan Road, Section 2; www.npm.gov.tw) is reputed to be the finest repository of Chinese art in the world. Boasting some 620,000 priceless treasures, mostly purloined from the old imperial collection of mainland China and painstakingly transported (with no damage or breakage) to Taiwan by Chaing Kai-shek and his followers after their defeat by Mao Zedong, means this priceless booty has been preserved from the ravages of the Cultural Revolution. So large is the assemblage that only a small fraction can be displayed at any one time. The jade collection, with its magnificently carved centerpiece, an intricate emerald jadeite cabbage, is breathtaking. The question on everyone’s lips as they ogle the artifacts is, “How did they make such perfect and sophisticated pieces over 6000 years ago?” Admission is NT$160 (AUD$7) and while audio equipment is available for a self-directed tour, it’s preferable to join a free guided tour to fully appreciate this spectacular collection. Of course mainland China now wants the treasures returned, but the Taiwanese appear to be taking good care of them. Following a two hour tour, retire to the San Shi T’ang Tea Room on the fourth floor to sample Taiwan’s finest oolong tea. Imagine if the greatest treasures of the National Museum became edible! That’s the concept behind the food offered at Silks Palace Restaurant complex (221 Chishan Road Section 2; www.silkspalace.com.tw) located adjacent to the National Museum. The elegant interior design derives much of its style from the riches of its celebrated neighbour. The ornate light shades are fashioned to resemble the Museum’s Tsung-chou bells, while the designs on the walls were inspired by the ancient frosting patterns of the Museum’s celebrated Ju kiln ware. And that food! 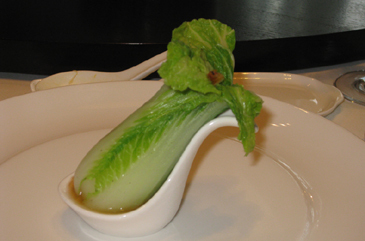 The small poached Chinese cabbage heart, served with shrimps, is fashioned to look exactly like the Museum’s famed ‘Jadeite cabbage with insects’, while a delicately carved portion of Dongpo pork, mimics the revered Ch’ing dynasty meat-shaped stone. No meal would be complete without sampling the Silks Palace classic dessert box modeled on the Emperor’s curio collection. Chic, exquisite artistry —— and so very delicious. The complex contains a number of restaurants. There is fine dining on the first floor where dinner costs about NT$680 (AUD$30), while the ground floor cafeteria offers Taiwanese and Cantonese dishes from NT$22 (AUD$1). Take home one of the elegant menus as a memento of the visit. Taipei is a large city and so much exploration has the potential to make the feet and legs ache. But relief is never far away in the form of the Six Star Foot Massage chain of shops (www.footmassage.com.tw). No ‘hole-in-the-wall’ outfit, these clinical establishments offer a professional, businesslike and hygienic service. Begin the session with a soothing foot soak in herbal water while enjoying a comforting neck and upper back massage. Then loll in a roomy leather lounger to sip green tea and generally chill out under the ministration of a qualified foot reflexologist. Soporific warm towels, applied to the lower legs and feet encourage total relaxation, and perhaps even a short nap. Each 40 minute session of pure indulgence boosts blood circulation, relieves stress, and eases tensions, in preparation for more potential pavement bashing. The NT$600 (AUD$26) charge seems almost too small for the benefits gained. While Taipei abounds with restaurants, bars, nightclubs and all kinds of nocturnal pleasures, the Eslite Bookstores (www.eslitebooks.com) could prove a fitting alternative for insomniacs – or manic travelers needing a literary fix. With branches all over the city, some of the stores remain open round the clock. Each carries an impressive selection of foreign and local literature – over 3000 imported magazines and a vast array of English language titles at competitive prices. As postcards are not plentiful around Taipei, these bookstores are the best places to make a purchase. Eslite’s wonderfully hospitable ambiance encourages browsers to lounge in the aisles, couples to cuddle in the alcoves, and some solitary souls to snooze until sunrise. And for those in need of a snack, or a ‘wake-up’ coffee, there’s always the in-store café. John Hagan visited Taiwan as a guest of Taiwan Tourism Bureau and China Airways.